I wasn’t able to blog much in May and June because I was working fairly intensively on a couple of projects, one a client report for The Futures Company and one (unpaid) for the Association of Professional Futurists, where I’m a Board member. The APF project is published next week, and I’ll write about it then. The Futures Company report was on the future of golf, and came out just in time for The Open Championship at Lytham St Anne’s. I’ve already blogged about it at The Futures Company blog, and it can be downloaded from The Futures Company or from my ‘Selected Articles‘ page. But it’s worth a few more notes here. The main observation is that golf is being shaped by the same factors shaping the rest of the planet. Maybe this is an obvious point, but it deserves spelling out. If you do a rapid scan of those factors, you get quite quickly to the rise of the Asian economies, urbanisation, the emergence of women into the workplace and public life, the proliferation of digital ICT, and the rise of sustainability. And all of these issues are playing out in golf, whether it’s the surge in the game in China (and even India) which is bringing thousands of kids into the game, or women taking up the sport – a source of growth in places where men are playing less, or a greater focus on shorter forms (six or nine holes rather than 18), or smarter tech on courses or in golf simulators, or – belatedly – attention being paid to making golf courses more sustainable. Golf is regarded as a traditional sport, even conservative, and it’s also the case that golf has done well from the shift in incomes towards the better-off. Golfers are more likely to take holidays on which they can play golf and spend more when they get there, and the most unlikely places (Cuba, Vietnam) are building golf courses as part of their tourism strategies, which on the one hand opens up potential conflicts over land use (as also seen in Scotland with Donald Trump’s course) but also tends to come with a golf development programme. It will be more international. Historically, golf has been associated with countries in the richer world, in particular the US and the UK. It will become more international, with more world-class competition golf being played in more countries. This will encourage the emergence of more professionals from these countries, creating a virtuous circle of greater coverage, enabling youngsters to identify with local success, and encouraging local sponsors and brands to move into the market, creating more funding and more opportunities for development. engagement with the game, and participation in it, is also increasing. The result will be a game that is both younger and less male. We expect that by 2020 most clubs will be more family-friendly, in the clubhouse, in the practice areas, and on the fairways. The game will be more flexible. Golf is increasingly moving towards a model where shorter versions of the game are encouraged. We expect to see this extended by a range of new competitive formats which enable professionals to play against each other in events which take only a few hours rather than the four days of a full strokeplay event. Golf will be more accessible. The public perception of golf is still, to some extent, influenced by the attitudes of a small number of exclusive clubs. The development of short courses, of versions of the game that can be played in urban spaces, and of technology-enabled play will open the game up to people who are as interested in the sport of golf as its reputation. There are business model challenges here: the membership model doesn’t help. It will be more technologically engaged. Digital technologies are rapidly becoming mobile, local and social. Courses and clubs are already using social media, and beyond the mobile device, sensors are now so cheap that it is possible to embed them in objects just in case. Applications could include learning and coaching applications, such as the ‘smart club’ which can remember – and improve – your swing. Sensors will also be valuable to groundsmen and women in improving the maintenance and management of courses. Courses will be more sustainable. Golf has been behind the curve on sustainability, but this should be an opportunity for the sport to develop expertise while also reducing costs. Water consumption will have to be reduced for courses in many parts of the world. But the land management expertise of golf groundspeople is already high, and the future golf course will be embedded in the local water systems of their communities, and supporting local biodiversity through the design and management of courses. 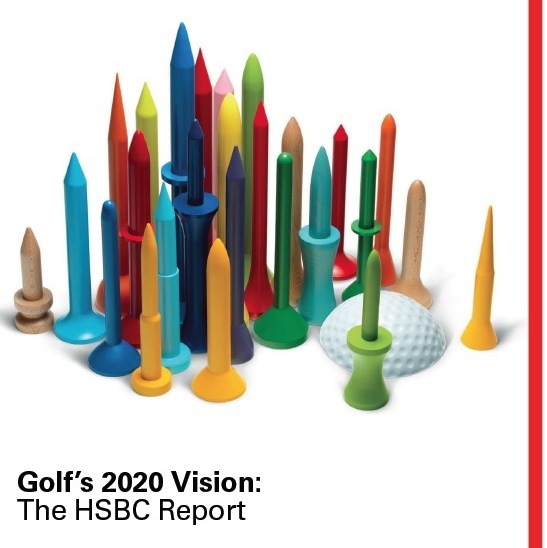 The image at the top of this post is the cover of Golf’s 2020 Vision: The HSBC Report, and it is used with thanks. The best thing about a golf simulator is definitely the opportunity to effectively play with no strain, green charges, or tee times. Clarity in addition to realistic look could be the elements that create the simulation appear to be genuine and life-like. Well, we already developed the new generation “Hybrid golf ball” to compliment the shorter distance golf course…now being played on many of executive mid-length courses. Next comes the development of the condensed sustainable hybrid golf course to match. The ball is designed for the new culture of golfer, wanting quick, affordable & less frustrating play. Makes the game FUN & Challenging for golfer’s of all levels!